Bring your friends a lot closer with full screen video at your fingertips. Free Skype to Skype calls and IM over 3G or WiFi connection. Talk face to face or show what you’re seeing using front and rear cameras. Get ultimate freedom by pairing your Bluetooth headset with your iPad. Send a message you can see, hear and feel with video messaging. 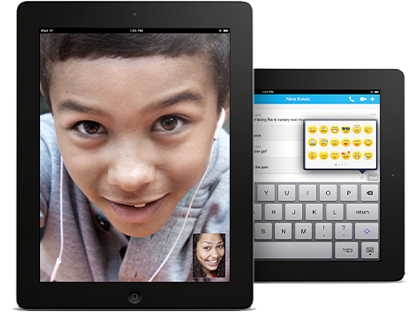 Share all your special moments on Skype, whenever you want, wherever you are. Your mobile data rates may apply. Send and receive video using front or back camera on iPad 2, iPad 3rd Generation, iPad 4th Generation, iPad Air, iPad mini and iPad mini with Retina display.